Assam is situated in the northeastern part of India. This state is bordered by Bhutan, Nagaland, Arunachal Pradesh, Manipur, Meghalaya, Tripura, Mizoram, Bangladesh & West Bengal. Besides tea plantations & hill stations, this state is also famous for providing facilities for higher education in the engineering field. Assam has many top engineering colleges of the country like IIT, NIT, etc. The literacy rate of Assam is 73.18 %. 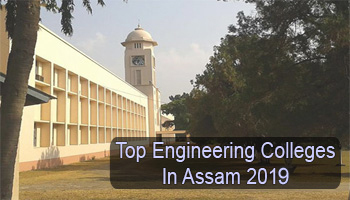 Through this article, candidates can check the list of Top Engineering Colleges in Assam 2019. Here at Sarvgyan.com, we are presenting a list of top engineering colleges in Assam 2019. In this list, we have included the top institutions like IIT – Guwahati, NIT – Silchar & various other government, private & deemed universities of Assam state. There are various factors have been considered while rating the colleges. The colleges have been rated on quality of education, national importance, affiliation & approval, faculty ratio, student’s preferences, college infrastructure & facilities, placement records, etc. Students can get admission in B.Tech course through Assam CEE (state level exam) and JEE Main (national level exam). Students can appear in any one from these examinations to get admission into B.Tech course. For admission in IIT, it is necessary to qualify both (JEE Main & JEE Advanced) examinations. To get admission in top colleges, students have to secure good rank in the entrance test. Through GATE exam, students can get admission in M.Tech programme. Engineering courses are offered in a wide range of specializations. Students can choose specializations as per their interest. Some specializations are Computer and Science Engineering, Civil Engineering, Mechanical Engineering, Electronics and Communication Engineering, Chemical Engineering, Electrical Engineering, etc. For any other queries about Top Engineering Colleges in Assam 2019, you may leave your queries below in the comment box.